Indicators will only run on NT 7.0.1000.5 or later. Options for the OHL indicators: Open, high and low of the current period, Fibonacci retracement levels calculated from current high and low, noise bands, target bands based on the average daily/weekly/monthly range. Chart settings: Please set the right side margin under chart properties to 200 to allow for correct display of the labels. The colors are adapted to dark chart backgrounds. Session templates: The indicators require the use of a correct session template for the instrument shown on the chart. With an ETH template only ETH pivots, ETH OHL and ETH noise and target bands can be displayed. For displaying RTH pivots, it is recommend to use a multi‐session template that divides the day into the night session, regular session and after‐session. "Calculate from session" = "DailyBars": Pivots are entirely calculated from daily data. "Calculate from session" = "ETH" & "Settlement/Close" = "DailyBars": High and low are taken from the full intraday sessions. The close or settlement price is taken from daily data. "Calculate from session" = "RTH" & "Settlement/Close" = "DailyBars": High and low are taken from the regular intraday sessions. The close or settlement price is taken from daily data. "Calculate from session" = "ETH" & "Settlement/Close" = "Intraday Close": High and low are taken from the full intraday sessions. The close is the last price traded for the full session. "Calculate from session" = "RTH" & "Settlement/Close" = "Intraday Close": High and low are taken from the regular intraday sessions. The close is the last price traded for the regular session. Auto setting for the 3 pivot indicators: The Auto setting will preselect ETH for FOREX and all CME currency futures, but preselect RTH for all other instruments. VWAP: The VWAP of the prior day is always calculated from intraday data. Depending on the chart resolution it can be a few ticks off the correct value. Auto setting for the 3 OHL indicators: The Auto setting will preselect the third intraday‐session as the regular session for FOREX & currency futures, but preselect the second intraday‐session for all other instruments. Noise Bands: The OHL indicators can be used to display noise bands. The noise is determined by averaging the smaller move Min (High ‐ Open, Open ‐ Low) over N1 & N2 days. The average values are displayed in a data table. The noise is added to and subtracted from the current open. Target Bands: The OHL indicators can be used to display target bands. The targets can be determined in two different ways: Either the average daily range over N1 & N2 days is added to the current low (high projection) or subtracted from the current high (low projection), or the daily expansion from the open Max(High ‐ Open, Open ‐ Low) is averaged over N1 & N2 days and added to and subtracted from the open. The average daily range or average daily expansion is shown in the data table. GLOBEX holiday sessions with settlement next day: The indicators are preconfigured for Globex holiday sessions without settlement for trade date next day or later. These trade dates are President's Day, Martin‐Luther‐King Day, Memorial Day, Independence Day, Labour Day and Thanksgiving. The indicators will display double day sessions for these days for all GLOBEX and NYMEX traded instruments. Update Jan 23 2011: Globex Holiday Calendar for 2011. Holiday sessions will only be applied to Globex instruments. Price markers are now correctly formatted for US interest rate futures and FOREX. Update May 17, 2011: New signature for GetNextBeginEnd() implemented. Update May 24, 2011: Due to a bug, the new signature for GetNextBeginEnd() is only implemented for OnBarUpdate() but not for Plot() Override. Update June 21, 2011: The indicator now works with half‐pip FOREX feeds. Indicator dialogue box improved. Update July 11, 2011: Indicator reshaped, small bug removed that affected weekly ETH pivots after a holiday that fell on a Monday. Update July 20, 2011: Serialization of the plots changed. Update December 12, 2011: Levels R5, S5 added. Some labels changed. Label size is now adjustable. Globex Holiday Calendar for 2012 added. Update February 16, 2013: Indicators entirely redesigned. Holiday calendar added for 2013. The former SessionNoiseBands & Session Volatility Bands have now been integrated into the CurrentOHL indicators. Update March 11, 2013: No added features, but 2 bugs removed that had affected the plots with specific settings. Update March 13, 2013: Bug removed, RTH pivots did not work, when data table was unselected. Update December 9, 2013: Holiday calendar added for 2014. Update January 22, 2013: CurrentDayOHLV42 did not display pivots for prior days when set to RTH. Bug removed. Update September 17, 2014: With indicator setting "RTH" current day's range is now displayed as 0 during the night session. Update September 20, 2014: Minor update, data table for ADR/ADN now plots on top of the indicator plots. 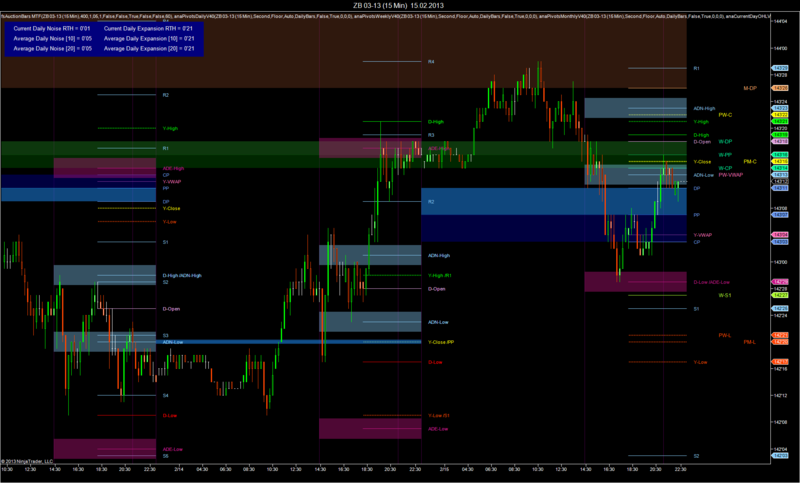 Indicator plots can now be accessed via SHIFT + mouse wheel to change the Z‐Order of the indicator. Update December 28, 2014: Holiday calendar added for 2015. Price markers improved for US interest rate futures. Update February 11, 2015: Minor update. Formatting of ATR/Noise improved for currency pairs with quote currency JPY.